Home > Vitamins & Food > What is the RDA? The RDA (recommended dietary [or daily] allowance) is the amount of each vitamin that people need every day. Apart from some or all of the necessary amount of vitamin D (made in skin exposed to sunlight) and some or all of the necessary amount of vitamin K (made by friendly bacteria in the gut), the RDA of vitamins must come from the diet. The recommended requirements change from birth to old age (see ‘Do Our Vitamin Requirements Change as We Age?’). The RDAs in this article are based on a World Health Organisation report published in 2004. Because these are not stored in the body, people must eat food containing the full RDA of these vitamins every day. Adults need 1.1-1.2 mg/day of vitamin B1. This is about a third of a cup of rice bran or wheat germ cereal, three cups of cooked peas or a cup of sunflower seeds with hulls. Adults need 1.1-1.3 mg/day of vitamin B2. This would be about four cups of skimmed milk or 250 g of cheese. 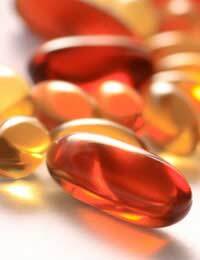 Adults need 14-16 mg/day of vitamin B3. This is about eight tablespoons of peanut butter, 225 g of white chicken meat, or a just over a pint of passion fruit juice. Adults need 5.0 mg/day of vitamin B5. This is two medium avocados, or about 75 g of sunflower seed kernels. Adults need 1.3-1.7 mg/day of vitamin B6. This is about four bananas or 225 g of cooked salmon. Adults need 30 mcg/day of vitamin B7. This is about 75 g of liver or one to two eggs. Adults need 400 mcg/day of vitamin B9. This is about 50g of chicken liver, just over a cup of lentils, a pint and a half of orange juice or 135 g of breakfast cereal. Adults need 2.4 mcg/day of vitamin B12. This is about 90 g of baked salmon, four eggs or 100 g of cooked beef. Yeast extract is a rich source of B vitamins. Adults need 45 mg/day of vitamin C. This is one kiwi fruit, one orange or one portion of steamed broccoli. Because these are not stored in the body, this is the amount the body needs each day, but food containing the full RDA of these vitamins does not have to eaten every day. Adults need 500-600 mcg/day of vitamin A. This is half a teaspoon of cod liver oil, a small to medium baked sweet potato with skin, or half a cup of cooked carrots or cooked spinach. Adults need 5 mcg/day of vitamin D. This is about 90 g of tinned sardines. The body can make this with three 15-minutes exposures to the sun each week. Adults need 7.5-10.0 mg/day of vitamin E. This is about 30 g of sunflower seeds or two tablespoons of sunflower oil. Adults need 55-65 mcg/day of vitamin K. This is about two cups of blackberries or one cup of shredded lettuce. When Might You Need More? Pregnant and breastfeeding women need more nutrients, but they should take care not to have too much vitamin A, as this can harm the developing baby.